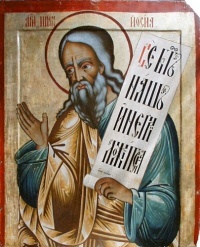 The Holy Prophet Hosea (Hebrew:הוֹשֵׁעַ, Hôšēă, Greek Ὠσηέ = Ōsēe) was the son of Beeri and a prophet in Israel in the eighth century before the birth of Christ. He is one of the Twelve Minor Prophets of the Old Testament. He was a contemporary of the Prophets Isaiah, Micah, and Amos. Little is known about the life or social status of Hosea. According to the Book of Hosea, he married the prostitute Gomer, the daughter of Diblaim, at God's command. He was a member of the tribe of Issachar and lived in the Northern Kingdom of Israel during the period 740–725 BC. In Hosea 5:8 ff., there is a reference to the wars that led to the capture of the kingdom by the Assyrians (ca. 734–732 BC). It is not certain if he has also experienced the destruction of Samaria, which is foreseen in Hosea 14:1. The Prophet Hosea strove to bring the many Israelites who had forgotten the true God of their forefathers back to the fold. He denounced the iniquities of the people of the northern kingdom of Israel, proclaiming to them the misfortunes they would suffer at the hands of invading foreigners. He foretold the end of the sacrificial offerings and the the priesthood of Aaron, Hosea 3:4-5. He prophesied about Christ, who would return from Egypt, (Hosea 11;1), would be resurrected on the third day, (Hosea 6:2), and would conquer death, (Hosea 1313-14). His feast day is celebrated on October 17. He is also remembered on the Sunday of the Holy Fathers which is the Sunday before the celebration of the Nativity of the Our Lord. through him we beseech Thee to save our souls. and foretoldest of the promise of grace, O Prophet. Rejoice, thou vessel of grace divine. Greek Orthodox Archdiocese of America. Hosea the Prophet. Coptic Orthodox Diocese of the Southern United States. Hosea the Prophet. This page was last edited on October 21, 2017, at 00:02. This page has been accessed 15,471 times.